The Marin Council, Boy Scouts of America, operates Camp Tamarancho in the hills above Fairfax. We provide access to several excellent mountain biking trails on camp property in partnership with the Friends of Tamarancho. Details and use conditions are in the FOT application form. Please download the form if you do not wish to pay online. Your submission of payment online with your credit card indicates your acceptance of the terms and conditions therein. When you buy a pass, you receive email newsletters from time to time with updates about Tamarancho as well as other trail news around Marin. If you order a pass online, your plastic pass (shown at right) will be sent to you within 10 days via US Mail. If you wish to ride before that time, keep a copy of the receipt with you as you ride. Also print and read this helpful map of the area - note the parking information in particular. 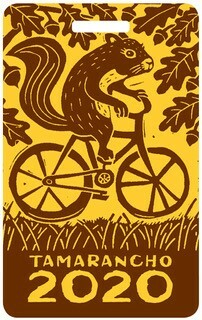 We wish you safe and enjoyable riding on the trails at Tamarancho. If you have questions, please email FOT@boyscouts-marin.org; call 415-454-1081; fax 415-454-5511; or mail Marin Council, Boy Scouts of America, FOT, 225 West End Avenue, San Rafael, CA 94901. Your donation is tax deductible: Tax ID# 94-1156323. Use the "Continue" button below or on the left to register online.